In the 1860’s the Torrance Free Mission was formed and meetings were held in a small hall at the top flat of Bella Place, situated about 50 yards from our present Church. The adherents and friends of the Mission, at a meeting on Wednesday 20th January 1869, decided that a new hall must be erected as the accommodation then used would soon be unavailable. Funds for this purpose were raised using subscription cards and, at a meeting in February 1869, the Mission Treasurer, John G Wilson, received a total of £115-9s-9d. A site for this new hall was eventually acquired and “The Free Kirk Box”, as it became known, was built. The Porch and Vestry were added later. The records tell us that the total cost amounted to £197-0s-7d, which included the lamps. 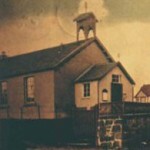 On Monday, 10th August 1869, at a meeting in the house of Andrew Semple, it was arranged that the Reverend D. MacLeod of the Free Church, Campsie, would take the Opening Service of the Torrance Free Church Mission Hall. 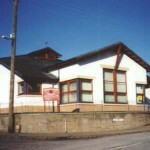 In the Year 1900, after union with the United Free Church, it became the United Free Church Hall, and remained so until 1917, when it became a full charge as the Torrance United Free Church. The union between the United Free Church of Scotland and the Church of Scotland took place in 1929, and our Church became Torrance Parish Church as it is today. It is an interesting coincidence that the first service in “The Free Kirk Box” was taken by the Reverend D. MacLeod and in the Church’s centenary year in 1979, the minister was the Reverend Murdo MacLeod who came to Torrance in 1955. The only alteration was to the old Porch, basically due to road widening operations. 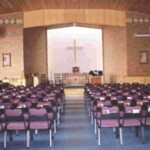 The new Church Hall was built in 1969 for about £6000 as compared with the £197 spent in 1869. The Centenary Service was held in the Church on Sunday 28th June 1970 and was conducted by the Reverend John M. Stewart of Colston Milton, the then Moderator of the Presbytery of Glasgow. Reverend Murdo MacLeod was Minister in Torrance from 1955 until his untimely death on 6 September 1980 after which the membership of the Church declined. The Presbytery of Glasgow appointed the Reverend Alec MacKay as Interim Moderator until such time as a new minister could be obtained. The Reverend Mrs E. Irvine from Milton of Campsie was made Interim Moderator of Torrance from November 1982 when the Reverend MacKay retired from the Ministry. During 1983 there was a proposal to link Torrance with Baldernock Church but that was not forthcoming. However a link with Kirkintilloch Park Church was agreed with Presbytery and on 19th April 1983 Reverend David Stewart was inducted as Minister for Torrance and Park Church. This linkage remained during the next 6 years until Reverend Stewart advised the Session that he was moving to Trinity St. Pauls in Cambuslang in August 1989. During the latter part of 1989 and through 1990, moves were going on to sever the linkage from Park Church and after many meetings with Presbytery, Torrance got their answer and were granted a Terminable Tenure appointment in may 1990. During that period, Reverend A. L. Walker acted as locum until our present Minister, Reverend Nigel Barge was appointed in March 1991. There was a period of growth during the late 1980s and 1990s and Torrance Parish Church was granted “full status” and the Restoration of Tenure was implemented on 11 May 1995 when the Presbytery of Glasgow was led by the Moderator Reverend R. Bell, who delivered the charges. The Reverend R. Bell also preached at both services on Sunday 18 June 1995 to mark the 125th Anniversary of the Church in Torrance. By the mid-1990s it became clear that the old Church building needed extensive repairs and was too small to accommodate all those whom the Lord had called to membership, who attended Sunday worship. Two services had to be held on Sunday mornings, one after the other, to cater for the membership. After much prayer, a decision was made to demolish the old building and build a new one of modern design. The membership pledged support for the venture and on Sunday 29 March 1998 the last Communion service was held in the old building that had served for over 130 years. It was demolished on the following day, Monday. Just before this the village War Memorial had been relocated from its position at the north side of the church to a new site in the village. The ground it had occupied, together with some additional ground was procured to make room for the new, larger building. Construction work was started immediately on the new Torrance Parish Church while services continued in the Church Halls. The old church bell was integrated into the new structure and is still sounded before each Sunday morning service. The ashes of the former organist, Tom Barr, are buried under the building. The new church building was opened and dedicated on 28 January 1999 by the Reverend W.J. Harvey, Moderator of the Presbytery of Glasgow. The new building can accommodate a congregation of around 250 in the sanctuary, with further seating in the “cafe area” for an overflow of 50. Video facilities relay the service to those on creche duty in the adjacent meeting room. The removable, stacking chairs allow multi-purpose use of the building. Tables can be brought in for special gatherings with food cooked on the premises for various groups (e.g. the men’s group and women’s group) or else the floor space can be cleared for drill marching by the Boy’s Brigade. Members and visitors can now enjoy a cup of tea or coffee and biscuits in the foyer/cafe style entrance after all services and meetings.